Pressure from the grinding process can cause damage to food products as well as induce unwanted heating or loss of natural oils. 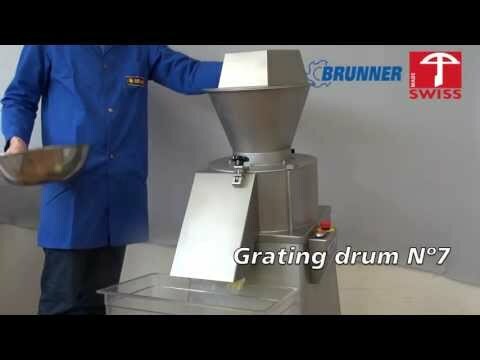 The IR 250 industrial food processor spins the raw material against the grating drum, before rotating vanes discharge the grated product. Brunner Anliker’s ingenious pre-rotation system utilizes centrifugal force to reduce contact whilst pushing up to 2,000 kilograms of material through the system per hour without undue pressure. Additions include a sieve drum for breaking up clumped, powdery materials and a mesh drum for straining vermicelli, apple puree and mashed potato.